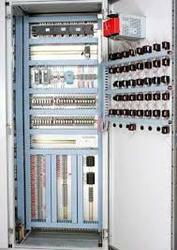 We are offering wide range of PLC Control Panel. It is used in control panel. It is a controller based systems available as per clients requirement. Low cost automation design and assembly lines are provided to enhance productivity, quality and reduce work contents. We offer our range at market leading prices. 10, 12 or 20 I/O. upto 40 I/O with Modular version versions with and without display & buttons. • PLC with integrated hmi & windows based software. • Gain full remote access using standard pstn or gsm modems, with control using sms feature. • In-built hi-speed counter upto 10khz + quad input. • Pwm high speed output settable upto 1. 5khz. Twido offers flexibility & simplicity. SLC 500 Controllers is one of the most contemporary and autonomous gamut of our company presented in rich conformance and adherence to the internationally set standards. We hold expertise in manufacturing and supplying precision Programmable Logic Controller. Programmable Logic Controller, available with us, is suitable for RO system. The Programmable Logic Controller is comprehensive and easy to use RO automation panel.